The intensive care unit is burdened with a high frequency of nosocomial infections often caused by multiresistant nosocomial pathogens. Coagulase-negative staphylococci (CoNS) are reported to be the third causative agent of nosocomial infections and the most frequent cause of nosocomial bloodstream infections. CoNS are a part of the normal microflora of skin but can also colonize the nasal mucosa, the lower airways and invasive devices. The main aim of the present study was to investigate colonization and the rate of cross-transmissions of CoNS between intubated patients in a multidisciplinary intensive care unit. Twenty consecutive patients, ventilated for at least 3 days, were included. Samples were collected from the upper and lower airways. All samples were cultured quantitatively and CoNS were identified by morphology and biochemical tests. A total of 199 CoNS isolates from 17 patients were genetically fingerprinted by pulsed-field gel electrophoresis in order to identify clones and to monitor dissemination within and between patients. An unexpected high number of transmission events were detected. Five genotypes were each isolated from two or more patients, and 14/20 patients were involved in at least one and up to eight probable transmission events. A frequent transmission of CoNS was found between patients in the intensive care unit. Although transmission of bacteria does not necessarily lead to infection, it is nevertheless an indication that infection control measures can be improved. The intensive care unit (ICU) is burdened with a high frequency of nosocomial infections often caused by multiresistant nosocomial pathogens. The poor health status of the patients and an extended usage of broad-spectrum antibiotics render this group of patients especially vulnerable. Barrier treatment, local guidelines for antibiotic use, close cooperation with infectious diseases specialists and restrictions with invasive treatment are all strategies that can improve infection control and can lower the incidence of nosocomial infections [1, 2]. Coagulase-negative staphylococci (CoNS) are reported to be the third most common causative agent of nosocomial infections and the most frequent cause of nosocomial bloodstream infections [3, 4]. CoNS are a part of the normal skin microflora but can also colonize the nasal mucosa, the lower airways and invasive devices [5–7]. These species have the ability to survive in the ICU surroundings on medical devices and medical equipment for weeks to months . CoNS, primarily Staphylococcus epidermidis, are specifically prone to cause catheter-related infections due to specific properties such as adhesion to biomaterial, like intravascular catheters and biofilm formation. The catheter-related infections are one of the leading causes of nosocomial infections in the ICU setting, with large national and local variations, and are associated with increased morbidity, increased mortality and additional costs [3, 4, 9]. CoNS infections compose a serious problem especially among immunocompromised patients and are often difficult to treat since CoNS strains are commonly multiresistant. In reports from different parts of Europe, the oxacillin resistance in CoNS varies between 70% and 80%, and similar high rates of resistance are also reported from the United States, Canada and Latin America [2, 9, 10]. In context, this multiresistance will lead to higher consumption of broad-spectrum compounds such as vancomycin, which increases the antibiotic pressure in the ICU, further promoting the development of antibiotic resistance. It is therefore important to gain more knowledge about colonization, transmission and pathways of dissemination in order to prevent cross-transmission and subsequent nosocomial infections of these bacteria . Subtyping of isolates to the strain level has been increasingly important in order to verify whether organisms involved in nosocomial outbreaks or in possible cross-transmission events are clonally related (i.e. have a common origin). Pulsed-field gel electrophoresis (PFGE) is a well-documented molecular 'fingerprinting' method widely used for analyzing epidemiological related bacterial strains responsible for nosocomial infections. A great advantage with PFGE is the ability to study large DNA fragments, up to 1,000,000 base pairs in length, contrary to conventional agarose gels. The whole bacterial chromosome is thus subject to analysis, giving the PFGE method power to clearly discriminate between unrelated strains and to demonstrate the relationship between genetically related isolates with a high reproducibility . The main aim of the present study was to investigate the gastric and respiratory tract colonization and the rate of transmission of CoNS within and between intubated patients treated in an ICU unit. A high rate of cross-transmission was detected according to PFGE analyses. Fourteen of 20 patients shared probably related strains with at least one other patient. Five epidemic PFGE genotypes were found that colonized two or more of the patients, and one subject was involved in eight transmission events. Twenty consecutive patients, admitted to the multidisciplinary ICU at Huddinge University Hospital, Stockholm, Sweden in two periods during April–August 1998, were included in the study . Inclusion criteria were adult patients requiring mechanical ventilation for a period of 3 days or more. Relatives' informed consent was collected before patients entered the trial. Fifteen patients were male and five were female. The median age was 59 years (range 34–82 years), the median Acute Physiology and Chronic Health Evaluation score was 24 (range 9–40), the median ICU stay was 9 days (range 3 to > 33 days) and the median time on mechanical ventilation was 6 days (range 3 to > 33 days). The ICU ward consisted of four single-bed rooms and three rooms with three beds each. On average, two patients shared one nurse and one or two assisting nurses. The study was approved by the Local Ethics Committee at Huddinge University Hospital, Stockholm, Sweden. Samples were collected within 24 hours after intubation, every third day until day 18 and then every fifth day until day 33. The sampling locations were the oropharynx, the stomach, the subglottic space and the trachea. Sampling was performed as described earlier . Subglottic secretions were aspirated via a special suction device in the endotracheal tube and were preceded by disinfection of the outer channel surface with 70% isopropanyl. Tracheal secretions were aspirated with a sterile suction catheter via the tracheal tube (EVAC Hi Lo, Mallinckrodt, Athlone, Ireland) or a tracheostoma cannula directly into sterile tubes. The samples were transported in transport media to the Division of Clinical Bacteriology, Huddinge University Hospital, Stockholm, Sweden, within 30 min of collection, and were stored at -70°C until analysis. All the samples were cultured quantitatively and qualitatively, and CoNS were identified by colony morphology, by Gram staining, by catalase tests, by DNase tests and by coagulase tests . One CoNS isolate of each colony-morphology type, from each site and sampling occasion, was stored in glycerin-containing broth at -70°C until further analysis. All collected CoNS isolates (n = 199) were further subtyped with PFGE, using a modified protocol based on a previous description by de Lencastre and colleagues . Chromosomal DNA from the CoNS isolates was prepared and the DNA-containing disks were restricted overnight with Sma I (Promega Corporation, Madison, WI, USA) at 37°C and loaded in a gel run for 20 hours at 11.3°C in a contour-clamped homogeneous electric field apparatus (Bio-Rad GenePath™ system; Bio-Rad Laboratories, Hercules, CA, USA). Digestion patterns were visualized by staining with ethidium bromide. The similarity coefficients were calculated according to Dice. The control strain S. epidermidis ATCC 12228 was included at least twice on each gel. Inclusion of the control strain served as a control of running conditions and of subsequent software aided normalization of the banding patterns. Calculation of the similarity matrix and the creation of dendrograms was carried out with the Molecular Analyst® software program (Bio-Rad Laboratories) using the unweighted pair group method and arithmetic averages. According to Tenover and colleagues, isolates revealing up to three bands difference are considered probably genetically related, and isolates with four to six bands difference are considered possibly related . In the present study, however, sampling was performed in a single ICU during a short time span. Isolates with an identical band pattern were therefore considered as one genotype, while isolates with one to three bands difference were classified as a PFGE group. Blind duplicate samples, other than the control strain, were run in the software analysis to check the appropriateness (Dice coefficient, 93–100%) of the dendrogram created. The presence of two isolates of the same genotype in two patients were considered as one transmission event, while specific PFGE groups isolated from more than one patient were referred to as probable transmission events. The minimal inhibitory concentrations of penicillin, erythromycin (Astra, Södertälje, Sweden), oxacillin (Sigma-Aldrich, Stockholm, Sweden), gentamicin (Biochrom, Berlin, Germany), clindamycin, ciprofloxacin and vancomycin (Eli Lilly, Stockholm, Sweden) against 182 of the CoNS isolates were determined using the agar dilution method performed as recommended by the National Committee for Clinical Laboratory Standards (NCCLS) . Staphylococcus aureus ATCC 29213 and Escherichia coli ATCC 25922 were used as reference strains. The breakpoints for resistance were set according to the NCCLS (penicillin, R ≥ 0.25 μg/ml; oxacillin, R ≥ 0.5 μg/ml; erythromycin, R ≥ 8.0 μg/ml; gentamicin, R ≥ 16 μg/ml; clindamycin, R ≥ 4.0 μg/ml; ciprofloxacin, R ≥ 4.0 μg/ml; and vancomycin, R ≥ 32 μg/ml). Seventeen of the 20 patients were colonized with CoNS on at least one occasion during the study period. One to 25 isolates per patient were analyzed. Sixteen patients were colonized by CoNS in the lower airways (i.e. the subglottic area and/or the trachea) during the study period, of whom 10 patients were colonized already at the onset of intubation. Among the 199 isolates originating from 17 intubated ICU patients, 74 clusters referred to as PFGE groups, each including isolates with zero to three bands difference, were revealed by PFGE. One to 12 PFGE groups were isolated from each patient (Table 1). The first site within a patient where a specific PFGE group of CoNS was detected was in the oropharynx (n = 23), the stomach (n = 9), the subglottic space (n = 9) and the trachea (n = 21), respectively. Simultaneous colonization at two or more sites occurred for 12 PFGE groups. For seven PFGE groups we were able to follow a colonization route from oropharynx and/or the stomach to the subglottic space and/or trachea. One isolate of each unique genotype per patient was further analyzed regarding relatedness to other genotypes. Five unique genotypes were each detected in more than one specific patient, as shown in Fig. 1, strongly indicating transmission between patients. However, a total of eight PFGE groups were found in which each was isolated from at least two patients. Each PFGE group consisted of either one single genotype or of several probably related genotypes displaying one to three bands difference (Table 2). Eleven to 14 patients were involved in at least one transmission event based on genotype or PFGE group classification, respectively (Tables 1 and 2). Pulsed-field gel electrophoresis (PFGE) image of genotypes isolated from two or more patients. Capital letters indicate the PFGE group and numbers denote the genotype. Sampling was made from the oropharynx, the stomach, the subglottis and the trachea. Sampling day 1 is equivalent to the day of intubation of the particular patient. *Genotype. Pt., patient. The ICU stay of involved patients overlapped for all but two clusters. 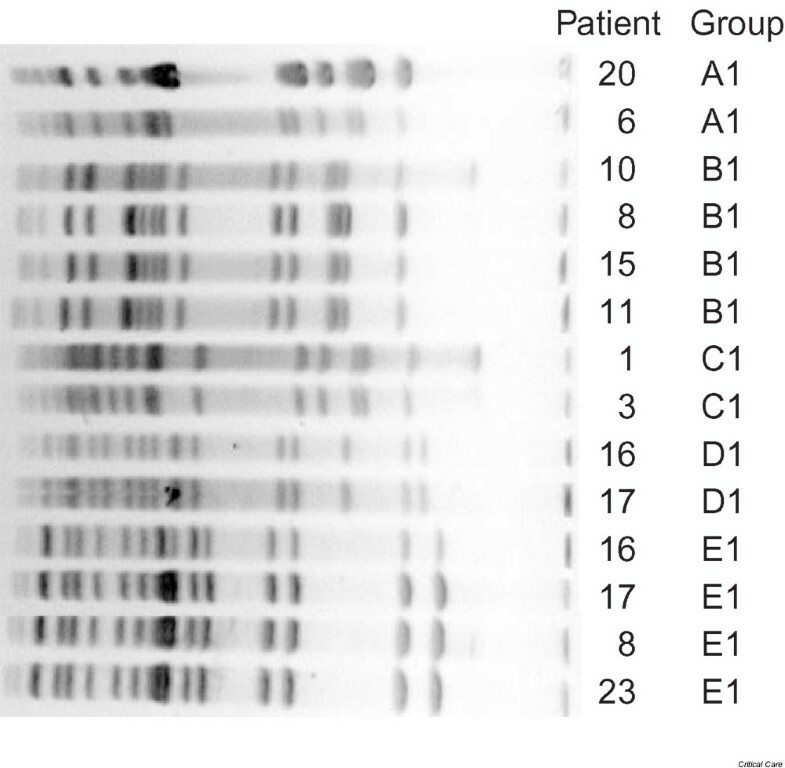 According to the genotypic analyses, both patient 6 and patient 20 had isolates belonging to the same PFGE type, although patient 6 was discharged approximately 3 weeks prior to the admission of patient 20. In addition, patient 17 was discharged 1 week prior to the admittance of patient 23. Thirteen patients were each involved in one to six probable transmission events, while one patient (patient 8) was involved in eight transmission events (i.e. shared genotypes with eight other patients) during her ICU stay of nearly 3 months. A total of 182 isolates were analyzed regarding the minimum inhibitory concentrations of penicillin, oxacillin, erythromycin, clindamycin, gentamicin, ciprofloxacin and vancomycin. The rate of resistance according to the NCCLS  was 95% against penicillin, was 86% against oxacillin, was 48% against erythromycin, was 42% against clindamycin, was 54% against gentamicin, was 66% against ciprofloxacin and was 0% against vancomycin. Multiresistance was commonly seen: 21% of the isolates were resistant to six tested antibiotics, 34% to at least five tested antibiotics and 59% were resistant to at least four of the seven tested antibiotics. Resistance patterns were mainly, but not always, uniform within PFGE groups; discrepancies were found regarding ciprofloxacin and gentamicin susceptibilities. Genotype B, which was isolated from four patients, consisted only of isolates with phenotypic resistance to all of the tested antimicrobials except vancomycin. Nosocomial infections often proceed in two steps. The patient first becomes colonized on the skin or mucosal surfaces by a nosocomial strain, originating either from another patient, from staff or from medical equipment. The strain may later become invasive, often due to impaired immune response, and cause infection. Colonization with both pathogenic and potentially pathogenic multiresistant microorganisms is common among patients in the ICU due to the high antibiotic pressure in these wards [5, 17]. It has previously been shown that cross-transmission of potential pathogens in severely ill patients is associated with nosocomial infections  and that improved hygiene prophylaxis leads to a decrease of cross-transmissions and, subsequently, a decrease of nosocomial infections [19, 20]. In the present study, which aimed to study colonization patterns and not infections, CoNS were colonizing the respiratory tract of a large majority of the included patients (17/20). In healthy humans, the lower respiratory tract is normally sterile and only sporadically colonized by transient microorganisms. The underlying severity of illness of the patients was reflected by the fact that 16 subjects were colonized in their lower airways on at least one occasion. Hospital treatment prior to intubation might influence this colonization pattern and also the fact that 19 of the 20 patients were undergoing antimicrobial treatment. The colonization pressure has an impact on both the risk for cross-transmission between patients and the risk for patients to acquire a nosocomial infection. It has been shown that colonization is a risk factor for infection with vancomycin-resistant enterococci and methicillin-resistant Staphylococcus aureus . Hand hygiene among the hospital staff is an important factor for preventing nosocomial colonization and infections . The compliance of the staff to hand disinfection is often poor in ICU wards, being lowest for the physicians, which further exposes these vulnerable patients to colonization of resistant organisms prone to cause infection. Cross-transmission between patients is also reported to increase due to under-staffing, with limited possibilities to maintain good hygienic procedures . An unexpected high frequency of cross-transmission of CoNS strains was found among the intubated patients included in the present study. At the time of sampling, hand disinfectant was not available at every patient bed. As a consequence of the findings from the present study, however, these routines as well as a hygiene educational program have now been introduced. Most isolates of the same PFGE group were recovered from patients whose intubation period in the ICU overlapped each other, which supports that a transmission between these patients had occurred. The discrepancy of the ICU stay in two cases could have three possible explanations: the strains could have resided in other patients who were not intubated and therefore not included in the study, the CoNS are known to have the ability to survive on surfaces such as medical equipment for a long period and, finally, the staff could carry these strains and transmit them to the patients during nursery and physical examination. Since the present study was not designed to monitor the skin flora, either from patients or from personnel, which constitutes a major reservoir of CoNS, the transmission dynamics may have been underestimated. Concomitant isolation from two or more sampling sites occurred for 12 different PFGE groups, making it difficult to establish a clear colonization route. The oropharynx and the trachea were the first sites of isolation of CoNS strains on 23 and 21 occasions, respectively, and a colonization route from the upper airway to the lower airway was only found for seven strains. Almost all (16/17) of the patients colonized with CoNS harbored two or more staphylococcal PFGE groups each, in contrast to the Gram-negative rods colonizing these patients where most of the patients harbored only one genotype per species (unpublished data). The majority of the CoNS isolates were highly resistant to multiple antibiotics. The resistance rates were similar or even higher compared to previous reports for clinical isolates, while strains isolated from the skin of healthy persons are considerably less resistant, indicating that these isolates belong to the nosocomial population [2, 8, 22]. It should be emphasized, however, that in the present study many strains were repeatedly tested for antimicrobial susceptibility, since each genotype often included multiple isolates. Methicillin (oxacillin)-resistant CoNS have been reported to spread clonally from patient to patient and even between countries . In a previous study, Villari and colleagues performed a 3-year prospective surveillance at a neonatal ICU that included 982 patients, 56 of which had infections caused by CoNS. Of 81 CoNS isolates 55.5% belonged to four clones, showing that epidemical strains can be responsible for causing a majority of infections over a long period . A similar clonal spread of CoNS in adults was reported by Monsen and colleagues, where peritonitis in six patients were caused by CoNS with identical PFGE pattern. All these patients were treated at the same dialysis ward during a 5-year period, and in most cases by the same team of physicians and staff . In conclusion, the results of the present study reveal that mechanically ventilated patients at a Swedish ICU were already commonly colonized with CoNS in the upper and lower respiratory tract at the onset of intubation. Transmission of multiresistant CoNS between the intubated patients occurred frequently, stressing the importance of infection control measures in this group of severely ill patients. Although transmission of bacteria does not necessarily lead to infection, it is nevertheless an indication that infection control measures can be improved. Sole registration of the incidence of nosocomial infections will greatly underestimate the efficacy of barrier treatment. Cross-transmission of CoNS occurs frequently between ICU patients. Hygiene measures are of special importance in the ICU ward. The present study was supported by grants from the Scandinavian Society for Antimicrobial Chemotherapy.